I have always loved goats. 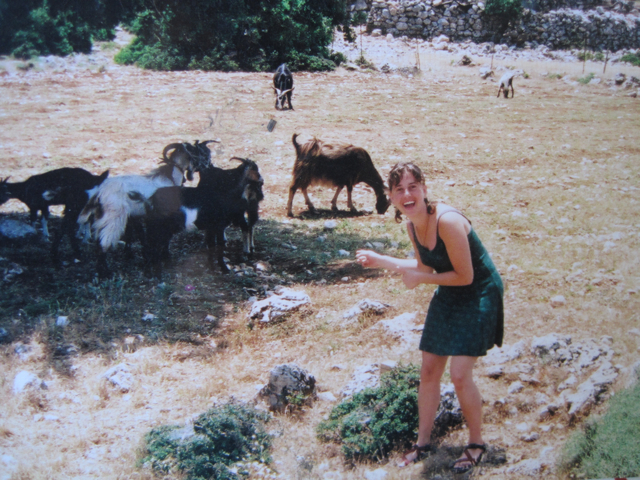 Spending time with goats during a trip to Greece in college. I love them so much, that I was given this as a birthday present. And I wear it all the time. 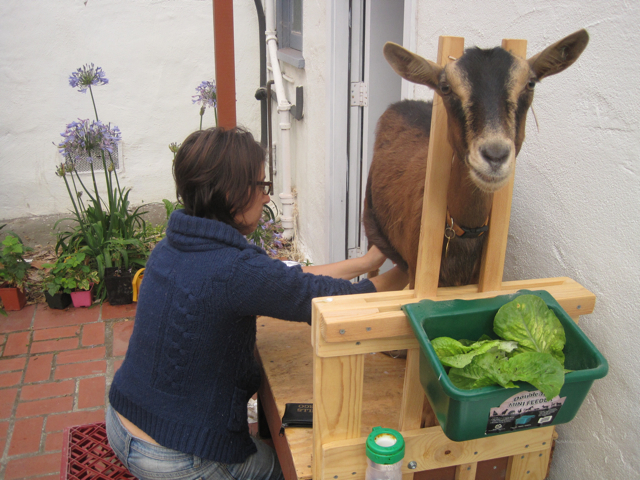 Back in the spring, my dear friend R said that she might be interested in getting goats. After nearly peeing my pants, I assured her that I would do everything in my power to help her with said goats, if that would make any difference in her decision. Whether it did or no, she got them. And she made the whole venture delightfully communal, offering a small group of her (and my!) friends a share of her gorgeous milking goat, Pippa. So now, on Wednesday mornings, I leap out of bed, grab my 2 quart jars and head to R’s for my morning milking. After a few milkings, my hands have gotten into shape enough that I can milk the entire 2 quarts all by myself in one sitting! 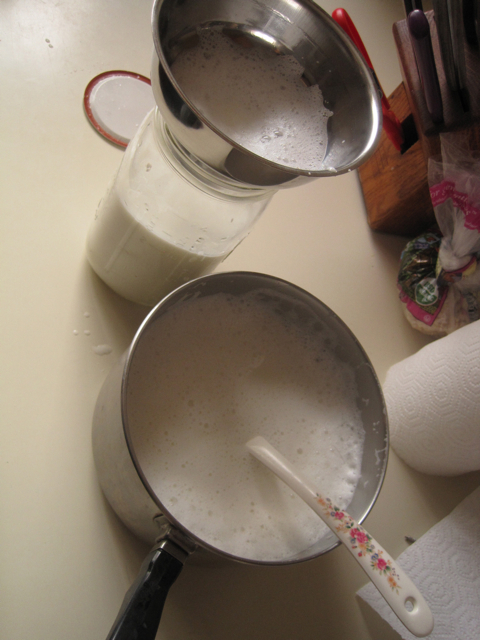 Then I filter the warm, foamy milk (thank you, Pippa!) into my jars. I get a small thrill every time I go to the grocery store and leave without needing to buy milk. And when I think back to how far I’ve come since posting this. And every time J asks for “Pippa milk.” I also feel a deep connection to the whole process, since I am also a lactating mammal. Everytime I milk her, I thank Pippa profusely. Because after all, we’re harnessing her body’s amazing ability to produce milk for our own benefit. And when she runs to the gate in the morning with her udder bulging with milk, I croon to her–I understand. I remember what that over full, desperate-to-nurse feeling is like. And I share some of her relief when the first streams of milk spray into the pan. And just in case this has been stirring some homesteading dreams of yours, I wanted to offer that R doesn’t have a palatial property for this whole operation. She does have a pretty big back yard. But more than that, I think she’s had the vision and done the work to transform her small space in the world into a thriving homestead (she has a garden and chickens too…swoon). See? Doesn’t this make you think you could do this too? Or find a friend who would let you in on their operation? Pippa’s adorable–you too! 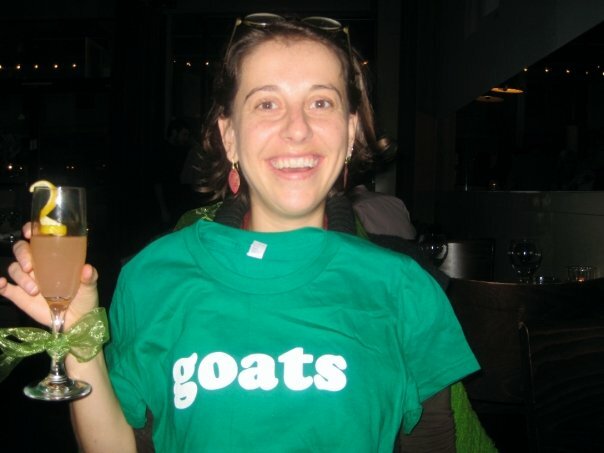 My friend Angie loves goats. I have to forward this to her. I have thought about this, as our garden grows bigger and we yearn to be a tid more self-sustainable. Goats and chickens sound like the way to go. 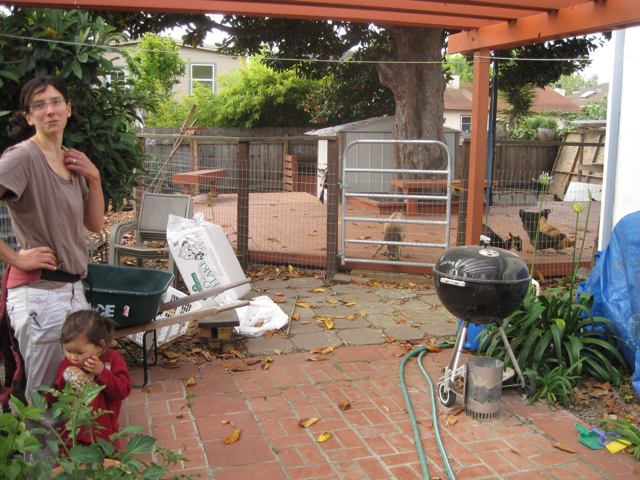 We live in a suburban neighborhood where those animals are a big no-no… but maybe in our next house. We do have a zillion turkeys roaming free in the street though. What happens to Pippa’s kids? I know several goat dairies around here who just give goats kids away (especially the males), and you can train them to be pack goats. Nice. I would like to do this also. How did your friend R get started doing this? Are any recommended books? I’m only asking because I’m having a hard time getting cows milk in the area I live, Odessa Texas. R got started by doing a lot of reading and online research and she just plunged in. I’ll have her take a look ad your comment and see if she has any recommendations! That’s all I can remember reading. Oh–online there are good resources, especially http://www.fiascofarm.com, and some of the dairy goat associations’ have good articles and resources, too.